I really love this tumblr! I don't read every day. I only read when I want too. Sometimes I think I'm talking to myself on my blog. It gets eerily quiet over here at times. I prefer to read on my Kindle. I think a paperback feels weird in my hands and it honestly isn't comfortable anymore. I love my Kindle. I'm obsessed with the romance in books. I judge the book by how good the romance is. My husband doesn't read. Oh, he can! But he won't pick up a book. He reads articles online. How did I marry such a man? I spend way too much time on Twitter. I only follow bookish people and things and it is really fun for me to be immersed in it. Romance novels pull me out of reading funks. I'm so in love with the Harry Potter audio books that I'm going to feel a loss when they are over. I'm on book 5 right now. I'm already dreading it. My best time to read is before bed. I'm kind of obsessed with keeping the spine uncreased on the paperbacks I own. Despite LD's aversion to reading books, you two are perfect for each other. @Angela So glad to know I'm not the only one!! @Christy this is true. LD and I may be polar opposites but we're perfect for each other! I do have a few of my favorite paperbacks that are definitely well loved. I allow it because o fhow much I loved the book. I've re-read them so many times it almost shows a story. HATE BOOKMARKS?! Are you crazy? I have one. It's the perfect plastic-y material that it doesn't get ruined but still super light weight. @uktreasuretrove omg. I do that too!! I actually have to stop myself from skimming ahead if I think it's boring just to get to the romance. the good bits! @Megan Glad I'm not alone. It gets quiet sometimes. I wonder what I'm doing wrong. I love my Kindle but when I have a stack of paperbacks I need to read I get them all done at the same time so they don't feel foreign to me going back and forth from my Kindle. I don't have a bookstore in my new town so my Kindle is really a blessing. But I do miss going into the book store. Mary, it sounds like we have a LOT in common! 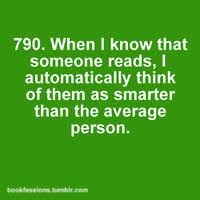 I like to read especially at night before I go to bed too, and I also fell in love with a non-bookish man! My whole family is full of really big readers so I guess I had to level it out with a love who didn’t read at all. Thanks for sharing your confessions! I'm right there with you on the Kindle! However, I read EVERYDAY! Always before bed but usually a decent amount of time throughout the day at some point. Usually when I'm nursing Riley. 1, 2, 4, 6, 7, 8, and 10. Check, check, and check! I got really addicted to my Nook last summer, so I made the rule that I was only allowed to use it if I was reading manuscripts. Somehow, I felt like a traitor for abandoning good ol' paper, but then sometimes I feel like a traitor for all the trees killed. Also, call me the bane of women's rights or what you will, but I feel like I spend a lot of books just waiting for the romantic interest to come back "onstage." The rest is just a side plot, so I totally get where you are coming from!